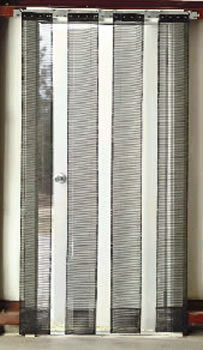 Mesh strips let fresh air in - keeps bugs out! from 12 oz. PVC coated polyester for long life and durability. using our patented MaxBullet® HTP mounting hardware. 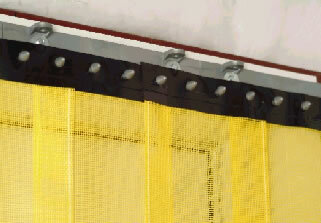 Air-Flex® is available in 8" wide Black or Safety Yellow strips. Air-Flex® may also be alternated with our clear stripping products. 8" wide x 7' long or 8" wide x 8' long. mounting system in the world! Back doors of restaurants, cafeterias, and food prep facilities. 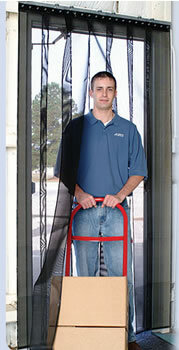 Personnel doors at commercial and manufacturing locations. Any open area where flying insects are a pest. (24) hours. This will allow the strips to return to their original form. header or wall position shown in Diagrams 1 and 2 using the appropriate fasteners supplied. desired spacing between strips as indicated below (Diagram 4). 3. Attach strip number 2 over strip numbers 1 and 3 (Diagram 3). in Steps 2 and 3. Rubbair Doors, and Traffic Doors from your source for material handling equipment.